This time capsule from a bygone era features an amazing Dean Martin bachelor pad and the delectable sight of Frank Sinatra go-go dancing in a rock club. 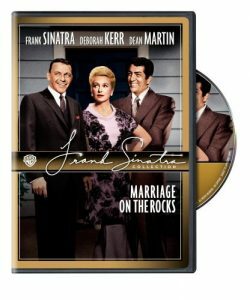 Such campy pleasures are the main appeal of Marriage on the Rocks, a sitcom-style comedy about marital dissatisfaction and legal confusion. Sinatra’s been married to Deborah Kerr for 19 years, but her boredom with his stick-in-the-mud personality has her leaping to shake things up–especially when a Mexican vacation accidentally divorces the two. How Dino gets himself wedged into this mess is the stuff of labored farce.